The Riley Chevrolet Buick GMC Cadillac dealership underwent a major expansion and renovation to their existing building on Christy Drive. The familiar family owned dealership had not undergone a major renovation since 1992, and the Riley’s felt the time was right to invest in this major renovation and addition. DOCC was selected as the general contractor for this huge project. Every aspect of the dealership’s 39,000 sq. ft. building was touched transforming it into a state-of-the-art sales and service center for their customers. 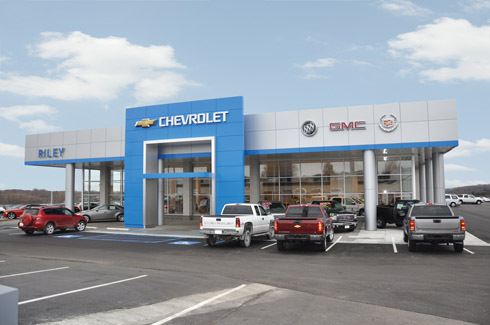 The architectural details were designed to meet the GM Facility Image Design Intent to bring a modern look to the dealership’s building, while improving the function of the sales and service departments, as well as operations. The building is much more visible, and at night it reflects a distinctive illuminating presence on the property.